DATE: SUNDAY 5TH APRIL 2015! 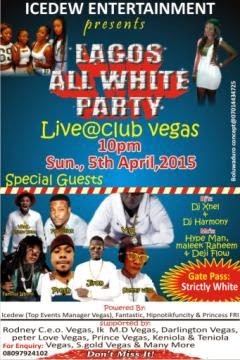 VENUE: CLUB VEGAS! 1 SHERATON LINK ROAD OPEBI IKEJA LAGOS! GATE PASS: STRICTLY WHITE! FREE CHAMPAGNE & FREE cABs for all the S*xiest Ladies + GUYS gET Hooked! SPECIAL GUEST» ORIsTE FEMI! YQ! JOE EL! PRESH! YBNL CHINKO EKUN! OLALEKESIDE (ELEguSHI spender)! FAMOUS IGBORO! JIRON! FLOWSICK! LEROY! GeOrGE ToWN eNt! LAULAU! KOGBAGIDI! DANKU! ROME EMPIRE ENT! DIMPLEZ! FAST RISING ARTISTES » SAMMY WILLZ TOP BALLER & SINGER! SCROW TOP BALLER! SNOOVY! SHOWILZU! FABULOUS! BACHURE AND MANY MORE!! SPecial guess DJ: DJ Charlee Shee of Eko fm & DJ charlescolee of Rainbow94.1fm!! 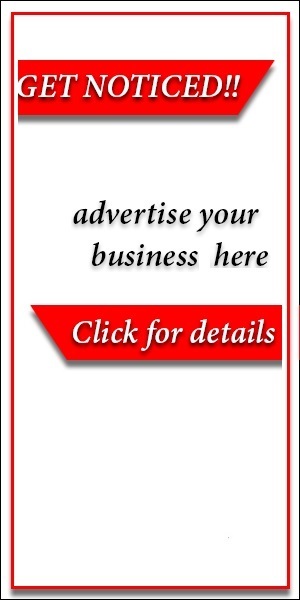 MEDIA PARTNERS: TSV MEDIA WUZUP 9JA! Rhyno007 of inspiration 92.3fm! ENT. NETWORK TV! MC ICE WATER OF EKOFM! DE- DON OF RAINBOW FM! LINCHUNG OF STAR FM & maNy more! SUPPORTED BY: RODNEY CEO CLUB VEGAS! IK MD VEGAS! DARLINTON mANager vegas! SABONGARI! MIZ POSH!PETER LOVE MANAGEr vEGAs! ICEDEW TOP EVENT MANAGER VEGAS! FANTASTIC EVENT mANager veGas! ENIOLA & KENIOLA ASSiSTANt MANAGER vEGas! SMILING GOLD PRO vEGAS! SADO SAVAGE! PRO VEGAS! SAGE VEGAS! V, cASH vegas! PROPErFix VEgAS! KENeDY vEGas + ALL WAITRESS club vegas! 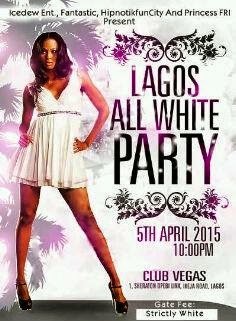 POWERED BY» ICEDEW ENTERTAINMENT TOP EVENT mANager CLub vegas! FANTASTIC EVENT mANager vegas! HIPNOTICFUNCITY & PRInCESS FRI!